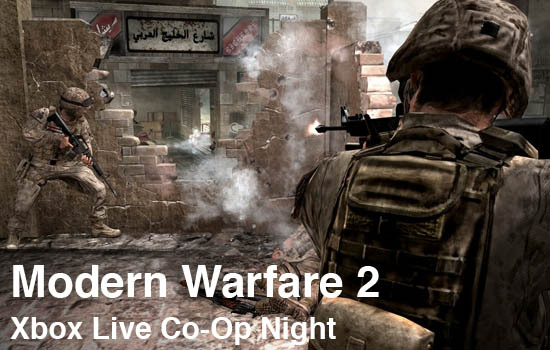 Modern Warfare 2 hits the Xbox 360 this Tuesday, November 10th. To celebrate we're going to have a special Xbox Live Co-Op night this Thursday, November 12th. We'll be checking out the 23 spec ops missions in the game's two player co-op mode. Festivities begin at 8PM EST this Thursday. To join up look use the game's built in matchmaking or send a friend request to the co-optimus gamertag (cooptimus) and utilize the friends of friends feature to find other gamers. We're looking forward to seeing you on the battlefield. Just don't forget your night vision goggles. Play through specific co-op scenarios in the Special Forces mode. 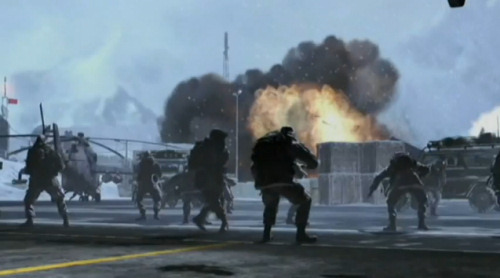 It's currently being described as similar style missions to the "Mile High" mission at the end of Call of Duty 4. Each scenario has different styles of play like survival modes, timed modes, and unique objectives. For instance one player may use a laser designator to target specific areas for another player who is in control of the DC-130 aircraft. Page created in 0.2926 seconds.